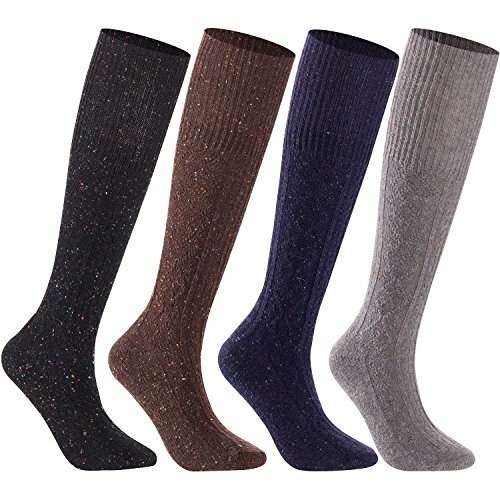 STYLE: Casual or formal dressing knee-high high crew wool socks with medium thickness. Great choice for hiking or boot socks! PERFECT MATCH for lady's mid-calf dress boots or heels with several colors to choose from! ELASTIC SIZE: One Size women US 5~9 / UK 2.5~7 / EU 35~39 / or big girl's L/XL. Measurement: length from toe to the heel: 7", stretchable to 9"; height from heel to calf with top portion folded down: 11.5", stretchable to 14.5"; Height from the heel to top of calf with top portion unfolded: 14", stretchable to 17.5". AUTHENTIC Lian LifeStyleTM Socks are shipped from Virginia USA only and arrive in US addresses in 3 to 5 days! Lian LifeStyleTM is a professional high quality apparel producer and seller who is committed to provide you with the best clothing products. We offer best warranty possible in the market: non question asked return policy for any reason because we want you to come back for more products that we are adding to the market every month and be satisfied with our products and services! If you have any questions about this product by Lian LifeStyle, contact us by completing and submitting the form below. If you are looking for a specif part number, please include it with your message.